As the revered, late Arnold Palmer said, “Golf is deceptively simple and endlessly complicated.” Ah, how true that is. Yet the game of golf has endured for hundreds of years and is the joyful pastime and sport for so many people. Whether you’re new to the game, or a seasoned veteran, most golfers are constantly searching for a way to improve their score. Golfers of any age and any skill level can benefit from a fitness regimen. When focused on increasing strength and mobility, as well as working on posture and balance, golfers will see an improvement on the course. So if you’re interested in taking your game to the next level, it’s wise to invest your time and health in an off-the-course program. Brandon Harris and Greg McLean are the owners of Premier Fitness Systems in North Scottsdale. As co-creators of their specialty fitness-based golf performance program, Harris and McLean have pinpointed the issues most golfers face and have developed specific systems and approaches with the golf athlete in mind. Harris explains their philosophy, “We offer five components of our golf program that are the perfect blend to ensure that we’re addressing any issue or weaknesses. Each component complements the others to create ultimate synergy within the workout. Our programs start with a detailed evaluation and swing analysis that allows for the trainer to understand the client’s needs and create a personalized plan.” Those five components include 3-Dimensional Movement (essentially balance training), Dynamic Flexibility, Core Development, Aerobic Intensity and Traditional Strength. “One of Premier’s key focuses is on posture. Most players don’t realize that their posture is to blame for their inability to be consistent on the course. By incorporating a lot of dynamic flexibility into our programs as well as strengthening weak muscle groups, we’re able to balance our clients’ bodies out, allowing for less swing faults and increases in rotational power and tempo control. Our programs focus a lot on unlocking the body and turning on muscles that haven’t been used in a while. By doing this, we’re able to improve driving distance, increased back-swing, better turn on the ball, proper swing path and most importantly, eliminate overuse injuries from occurring,” Harris continues. Bad backs, tight hips, painful knees and “golfer’s elbow” plague so many players. In fact, not only does it keep you from playing your best, some golf lovers have had to give up the sport due to pain or injury. Don’t let yourself be sidelined, get back in the game! 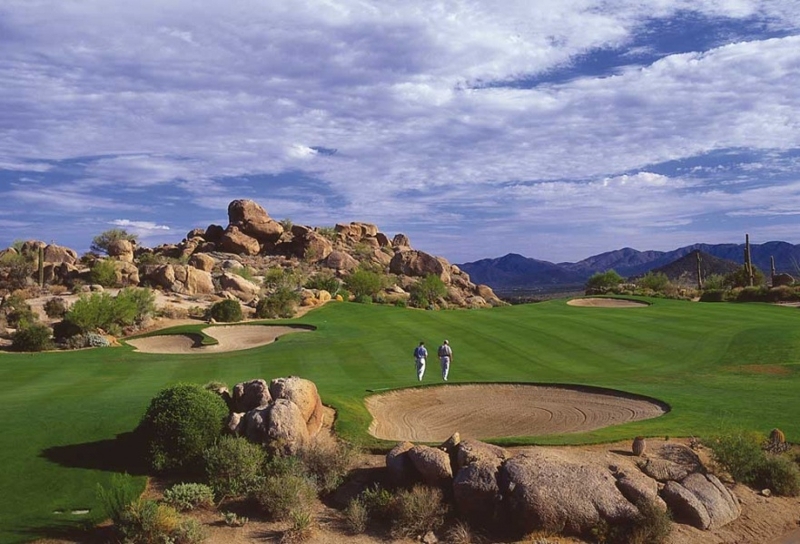 Golf Stretch Therapies is an innovative center in the Scottsdale Airpark that focuses on rehabilitation and therapeutic protocols to bring out the best in a golfer’s performance. Adam Swanson, founder and CEO, has developed his unique combination of Neuromuscular Stretch Therapy, Corrective Exercise, and Functional Training and has helped his clients achieve their fitness goals, increase mobility, correct posture, and improve their everyday lifestyle. In addition to the Stretch Therapy program, clients can benefit from a Corrective Exercise program, which helps in easing musculoskeletal pain and can reverse the damage done to our bodies while increasing mobility and stability of your joints. Golfers also can benefit from Cold Laser Therapy. It works by stimulating damaged cells to promote regrowth and speed up the healing process for injured areas. The benefits are numerous, including a reduction in swelling, inflammation and that nagging chronic pain. What does yoga have to do with golf? Quite a lot actually. Scottsdale resident Katherine Roberts has created a distinctly unique methodology that combines biomechanical science with yoga’s mind/body conditioning to deliver immediate improvements in a golfer’s performance. Roberts founded Yoga For Golfers and offers instructional classes throughout the Valley as well as a robust selection of instructional books and DVDs. “At the most basic level, golf and yoga are the same – the intentional and dynamic movement of the body in three planes of motion – the frontal plane (side to side), the sagittal plane (flexion and extension front to back), and the transverse plane (rotation). Yoga For Golfers’ proprietary methodology instructs and trains golfers on the biomechanics of the body as it relates to each stage of the golf swing,” explains Roberts. Most golfers know that physical preparation and practice is only part of a winning strategy. Golf is as much a mental game as any sport, if not more so. Knowing that your mind is highly responsible for your success on the course, what are you doing to sharpen your mental skills? Perhaps it’s as simple as playing a game. THINQ Golf offers training for your mind, through a scientifically-sound training method available to members online and within their mobile app. Their games have been specifically designed to help with a broad range of challenges that golfers face on the course. And, they’ve made them convenient, simple and fun. The games train five essential mental golf skills: awareness, intention, attention, synchronicity and adaptability. THINQ Golf games were recently named Golf Digest’s Editor’s Pick for Top Innovative Golf Product at the 2015 PGA Merchandise Show. Perhaps you should give it a try! Unlock Your Potential & Hit the Links!